This is the 4th pair of Sloggers ( 2 x Splash Boots & 2 x Splash Shoes) that I have bought from GardenWare. Love them! They are so comfy. I bought the latest pair of Splash Boots one size larger than my other pairs, which has been a great idea, as they are so much easier to get on and off. Really comfortable. Perfect birthday gift! Brought me much happiness. Ordered as a gift for my mother, with help from the excellent Customer Service Lady. Perfect fit, very comfy, and everything Mum’s heart desired. So precious they live on the top shelf in the laundry – out of reach from the doggies!! I’d love to say the boots I ordered were the perfect fit but for me they were too tight across the instep making them hard to get on. Once on my feet, apart from the tightness, they were very comfy though. Would’ve loved to impress my chooks with my style but may have to stick with the daggy and unfashionable black gummies for now :(. The only reason I’m giving 4 stars is because of the instep thing, otherwise they’d be a 5. They look lovely and feel comfortable. I haven’t had them long enough to know how well they last. They’re not cheap but they do fit well and frankly they give a real lift to my spirits – feel rather jaunty! Love them! very comfy and stylish, good foot support but not too tight. Highly recommend them. 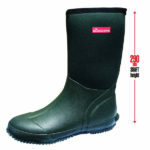 These are the second or third Sloggers Splash Boots I’ve bought from GardenWare and they won’t be the last. Sure they’re expensive but they last, they fit, and they look really cool. I wear them to the chook pen every single day–through Canberra’s 40 degree summer heat to the -5 degree winter chill. Teamed with some patterned leggings they are a real hit when you put out the recycling bin–I’ve even had cars toot their appreciation. And the chooks love them too. Those Girls have an eye for beauty. So, fork out the $100–they arrive quickly and you can start your own dynasty of Sloggers Splash.